“We have been manufacturing jacuzzi pre-soak tanks for exceptionally gentle reception and pre-cleaning of crop at high throughputs, for many years,” explains Edward Tong, Managing Director at Tong Engineering. “What makes our new pre-clean system different, is that it features an integrated destoning facility at the infeed end of the tank, as well as a built-in floating debris remover at the outfeed. By bringing these processes together in one tank, growers and processors not only achieve a more complete pre-clean system for enhanced washing results, but it also allows for reduced water consumption, combined water treatment and improved energy efficiency of the whole process,” says Edward. Suitable for use on a wide range of root crops, including carrots, parsnips, swedes and potatoes, the new pre-soak tank features Tong’s proven integrated destoner system which is popularly fitted at the infeed of Tong barrel washers. As crop is gently received into the new system’s water-filled tank, it enters the integral destoner. An impellor at the base of the destoner creates an upward pressure on crop, ensuring the vegetables float across the tank and into the jacuzzi pre-soak system. Meanwhile, any stones present within the crop drop to the bottom of the destoner, where a heavy-duty web elevator removes them up and out of the tank. 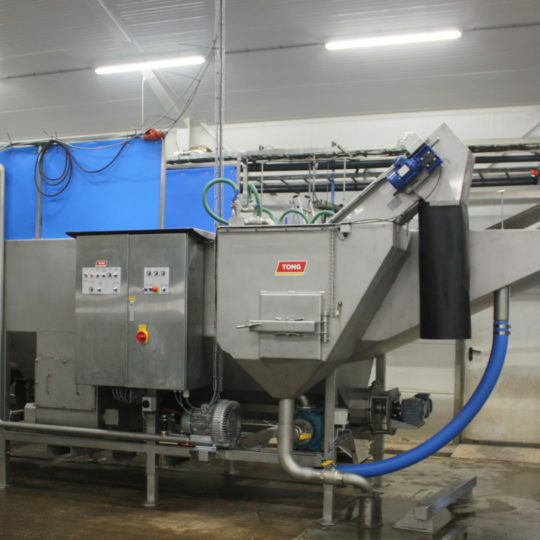 The innovative design of the new machine can be adapted to suit a wide range of throughput requirements, providing a complete pre-clean solution for root crop washing operations of all sizes. “The new machine is a valuable addition to our complete range of washing solutions which can be custom designed to suit small-scale crop washing facilities to larger-scale processing plants,” added Edward.